On this leg of the trip, we camped in Arcata, which we felt was the perfect spot to visit a handful of the National and State Redwood Parks; we’ll be visiting the most northern state parks next month as we loop back from southwest Oregon. Why redwoods? They are the world’s tallest living trees, having survived from the time of dinosaurs (about 160 million years ago) — just to be pushed to the brink of disappearing because of clearcut logging practices and climate change. Gold fever in northern California was quickly replaced with redwood fever and massive logging operations in the late 1800s. 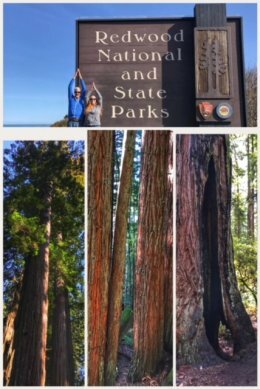 We started our ongoing redwoods adventure with a drive down the Avenue of the Giants into Humboldt Redwoods State Park, a 53,000-acre park that includes Founders Grove, honoring the men who started the Save-the-Redwoods League in the early 1900s. In 1921, the group purchased the first grove at what is now known as Humboldt Redwoods State Park. 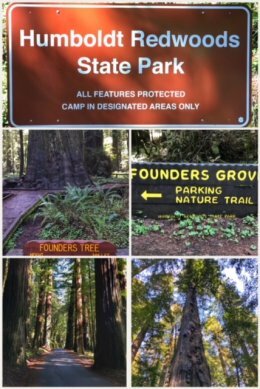 Definitely take a hike through Founders Grove (what we renamed Fallen Grove because of the many downed redwoods left where they fell due to age); the trees are amazing and it is a nice and quiet loop among many fallen redwoods. 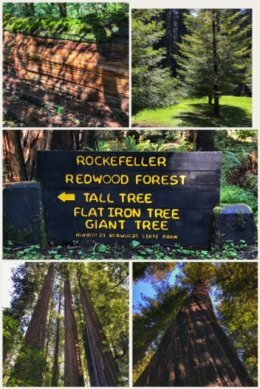 Next up was the 10,000-acre Rockefeller Forest, the largest remaining contiguous old-growth coastal redwood forest in the world, and part of Humboldt Redwoods State Park. 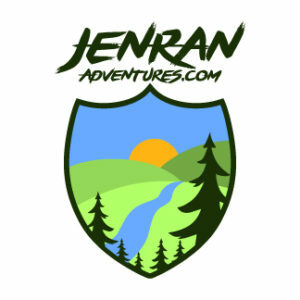 The land was purchased in 1931 by the Save-the-Redwoods League with a multimillion dollar donation from John D. Rockefeller Jr. and matching grants from the state of California. Just driving the road into the forest will excite your mind, with these gigantic redwoods almost blocking the road. You can find numerous hikes, but definitely do the Rockefeller Loop Trail, along the Eel River. The redwoods here have that deep reddish-brown bark that makes them truly stand out in the forest. After driving more of the Avenue of the Giants (a very scenic 31-mile alternative to driving Highway 101 — unless you get stuck behind pokey drivers), we stopped at the visitor center to rest and snack — though just a light snack because of where we were stopping next. We love cheese, and have a special place in our hearts (or stomachs) for Havarti and almost any cheese with garlic, so when we heard about a local Humboldt cheese factory that made these cheeses and many others, we had to pay a visit — and buy lots of cheese! The Loleta Cheese Factory, a family-run business, only make the cheese certain days of the week, but you can taste samples of about 30+ cheeses from 9 to 5 every day except major holidays. For folks who want to snack more, they also have an espresso and grilled cheese bar right next door. 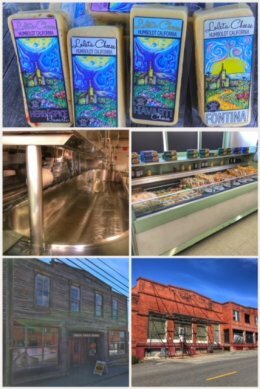 We left with several blocks of cheese, including their Herb & Spice Havarti, Roasted Garlic Jack, and plain versions of Havarti and Fontina. We finished this amazing day with a stop at another wildlife refuge, quickly becoming some of our favorite parks to visit. 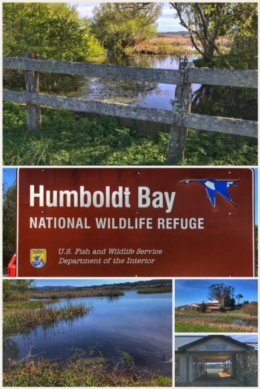 Humboldt Bay National Wildlife Refuge is located on an estuary (a place where fresh water from rivers and streams meets ocean waters), is part of the Pacific Flyway (a stopover for migrating birds), and is a sanctuary for Aleutian Geese (once an endangered species). The Salmon Creek Unit, which we visited, was an old cattle farm (McBride Ranch) that had drained the wetlands to make more pasture for the cattle; the U.S. Fish and Wildlife Service purchased the land in 1988 and has been restoring the lands ever since. Have fun hiking the 1.75 mile (flat) Shorebird Loop Trail. The last day on this part of the trip took us to Redwood National Park, national park #8 for those of us counting, as well as another of the state redwood parks. The national park is the newest among the redwood forests preserved in Northern California — created in 1968, at a time when almost 90 percent of all the original coastal redwoods had been logged. 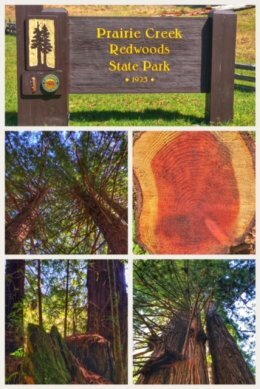 While many spots are worth visiting, we thoroughly enjoyed the Lady Bird Johnson Grove, which sits high on a ridge (about a thousand feet above sea level), with a 1.4-mile trail built for the park’s original dedication ceremony. The redwoods here have bark more grey than red, but that is perhaps due to the intense fog and moisture received. We also snacked at Elk Meadow, a wonderful little picnic area (on the way to Fern Canyon), and were rewarded with getting to see a small herd of Roosevelt Elk (a species that once was teetering on the brink of extinction; now thriving under protection) lounging in a pasture. The day ended with a quiet visit to Prairie Creek Redwoods State Park, where we got to witness another small herd of elk resting in an open pasture. This park has more than 75 miles of trails through old-growth coastal redwoods. For an easy hike, consider the 1.3-mile Elk Prairie Trail loop from the park’s visitor center. Why redwoods? These ancient and majestic trees do much for the ecosystems, from releasing phytoncides to replenishing oxygen, and are inherently significant. 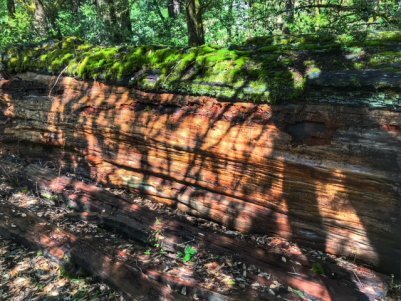 More than 1.92 million acres of old-growth redwood forest have been logged; with only about 80,000 (or 2 percent of the original number) old-growth redwoods protected in local, state, and national parks. Next up? 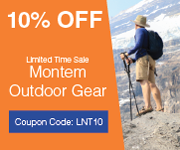 Inland adventures to the volcanic center of the Cascade Range!